L-R DeLance Minefee, Jeena Yi and Ryan Barry. Photo by Stan Barouh. Woolly Mammoth Theatre Company’s 35th season continues with the world premiere of Lights Rise on Grace written by NY based playwright Chad Beckim. The play might not be as shocking as some past Woolly Mammoth fare but that does not mean it is any less enjoyable. Grace (Jeena Yi) is an Asian American sixteen year old girl in high school when she first meets Large (DeLance Minefee). Large got his nickname from his mom at birth because she said he was born with a large head. For those of you that had other thoughts on this, get your mind out of the gutter. It was love at first sight for Grace and Large but he is African-American and the she is Asian American so the couple is subjected to taunting as they walk down the street together. Large’s homelife is no better as his brother constantly taunts him with how he thinks Large is a homosexual. One night Large hits his breaking point as he pummels his brother to the point of paralysis. His actions get him six years in prison. While there he meets Riece (Ryan Barry) who takes Large under his wing. The two become friends and after Large is released from prison and he hopes that Grace will take him back after not communicating with her for the last six years. The couple marries and has a son but Large likes hanging out with Riece more than being a husband and father. This as you can imagine does not sit well with Grace. Plus there is a secret that the two men are keeping from her that I will not reveal but it turns the story on its side. 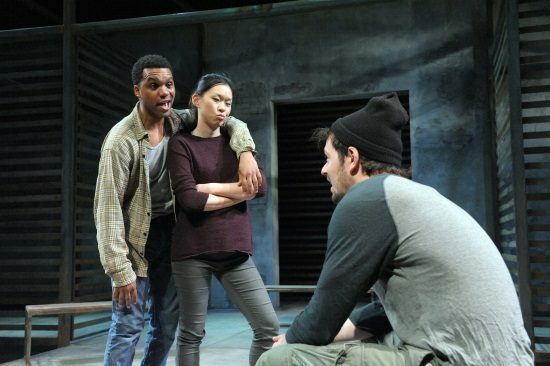 Chad Beckim’s Lights Rise on Grace at Woolly Mammoth Theatre Company proves that when you give familiar material a world class production, it is totally possible to create a fresh experience for the audience member. Chad Beckim’s story about an interracial relationship and street kid with a rough life isn’t necessarily original but you forgive it because the writing is so good. Beckim definitely knows how to write for character and hit every emotion while doing so. He really gets inside Large’s head and the confusion that is within, while with Grace he captures the story of a girl tossed out by her parents and trying to make it on her own perfectly. Director Michael John Garcés keeps the action moving at a pace that keeps you engaged the whole time while allowing the material to breathe so you don’t miss anything. Performance wise, the trio of actors deliver big time. Jeena Yi’s Grace starts off as appropriately awkward when she first meets Large. As the play progresses she gets some backbone and becomes stronger. Yi’s transformation of the character is mesmerizing and her performance is one that holds you from beginning to end. Ryan Barry as Reice gives a solid portrayal of a caring guy who has paid his dues. It was a breath of fresh air to see how he wanted to help Large and later Grace. Prisoner types onstage usually aren’t written like this. Last but certainly not least is the gut wrenching performance of DeLance Minefee as Large. Here is a character that could have gone for the all angry all the time approach but Minefee’s portrayal has many layers attached to it. You see that he regrets what he did to his brother and you know that he really does care for Grace even if he is confused about the whole relationship and his other demons. Minefee doesn’t hit you over the head as he could have and that is what makes for a solid and moving performance. The production elements match the performances. Luciana Stecconi’s iron clad set serves the action perfectly while Dan Covey’s lighting adds to the atmospheric grittiness of the piece. James Garver’s appropriately jarring and almost continuous soundscape complete the whole package. The modern-day costumes were designed by Ivania Stack. Chad Beckim’s Lights Rise on Grace at Woolly Mammoth Theatre Company proves that when you give familiar material a world class production, it is totally possible to create a fresh experience for the audience member. With Beckim’s strong script, a trio of superb actors directed to perfection by Michael John Garcés and production elements to match, here is one play to definitely add to your spring theatergoing schedule. Lights Rise on Grace runs through April 26, 2015 at Woolly Mammoth Theatre Company which is located at 641 D St NW, Washington, DC. For tickets, click here.